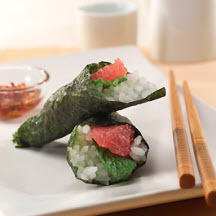 Spread sushi rice on rough side of nori, and add 1/4 of the grapefruit sections. Make cone roll. Wrap cone in a 4x8-inch rectangle of cellophane to keep fresh. Insert a mint sprig in the top. Repeat with remaining ingredients to make 3 more rolls. For Honey Chili: stir together chili and honey in a small bowl. Drizzle over sushi and serve.